What if there was a macular degeneration test that was better than the Amsler Grid? Easier to use, easier to track and more accurate. Mike Bartlett, the President of Vital Art and Science Incorporated, explains how this new smart phone app developed by two retina specialists can benefit those with macular degeneration. 1. 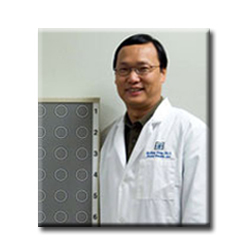 Tell us about the backgrounds of your co-founders, Dr. Yi-Zhong Wang and Dr. Yu-Guang He, and what led them to develop the myVisionTrack™ test. Dr. He is an Associate Professor of Ophthalmology, holder of the "Josephine Long Biddle Chair in Age-Related Macular Degeneration Research" and a retinal specialist at the UT Southwestern Medical Center, where he regularly treats those with advanced AMD. When Lucentis was approved in 2006 for treatment of wet-AMD it did bring about a dramatic change for those with wet-AMD. Now patients could go through a course of 3 - 6 months of treatments to bring their AMD under control, and they would recover a portion of their vision, but it was not a cure, and success of the treatments depends on timely treatment. Dr. He knew that their disease would come back, and getting those treatments as soon as possible when it did, was important because even 1 to 2 months of delay could lock-in vision loss permanently. The problem was how would patients know when their disease was recurring? The traditional home test for AMD patients for decades has been the Amsler Grid. It is a paper chart with a grid printed on it. When a person with AMD looks at the grid with one eye they will see a combination of wavy lines and blank or black spots. The Amsler Grid is inexpensive, and works for some people, but it has a number of documented problems. It is very hard for most people to either mark on the chart, or remember over weeks or months how big these affected areas were and decide if they have changed significantly. There is also an effect, known as "perceptual filling", where the brain tries to fill-in these abnormal spots. 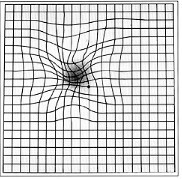 As a result most people cannot effectively use an Amsler Grid, even if they know that saving their vision depends on it. It happened that Dr. He had a friend who was working on vision function testing, and who might have a better way for patients to test at home. 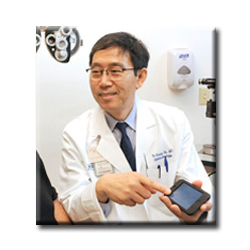 Dr. Wang is a full-time research scientist at the Retina Foundation of the Southwest, and has spent his career working to develop more effective vision function tests. One of the key goals of his research has been to identify those vision tests, which would be most sensitive at identifying loss in the macula, or central part of the retina. This is the area most affected by both AMD (age-related macular degeneration) and Diabetic Retinopathy, which together result in most of the blindness in the developed world. His goal was to identify a test which was less affected by issues at the front of the eye, which can be addressed with corrective lens or in the case of cataracts through surgery, and more sensitive in detecting loss in the macula. The result of his research was development of a shape discrimination hyper-acuity test which is sensitive at detecting changes in macular function and which can be delivered effectively on a smartphone. 2. How does the myVisionTrack™ test work, how is it better than the Amsler Grid and how frequently should it be used? 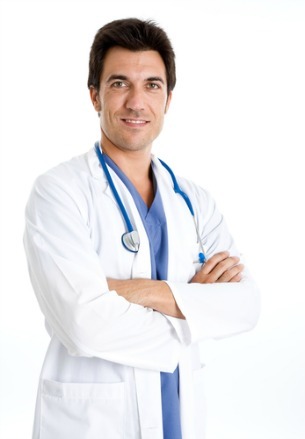 The test Dr. Wang developed is intuitively easy for any one to learn and use. 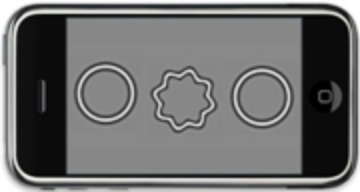 On the smartphone are displayed 3 circles, where one of them has been distorted. The instructions are simply to touch the one which is different, or the most different, because to those with AMD all three circles may look distorted. Each time the correct circle is picked then in the next display the amount of distortion is reduced. After 4 or 5 displays it will be hard to tell which is worse, and so it is OK to guess if you can't tell which one is worse. When you miss, then the distortion gets bigger and you will soon be able to see it again. After you have gone through several of these reversals where you can see it and then not see it then the test is able to determine the smallest amount of distortion you can repeatedly identify. 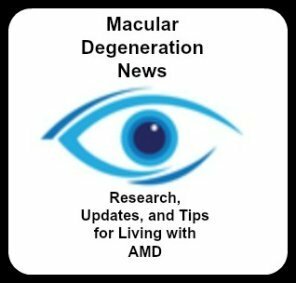 This result is stored and future tests are compared against this to detect a significant change, which indicates a need to see your physician again because treatment for the AMD may be needed. This testing takes 10 minutes to test both eyes, and we recommend taking the test twice a week. This is better than the Amsler Grid because there is no need for the user to remember, or try to record the results, and then decide if a big change has occurred. Just take the test and the device will determine if your vision has changed significantly, and the test results will be sent to your physician for them to decide if you should return to be checked. 3. Who would benefit from this type of vision monitoring? 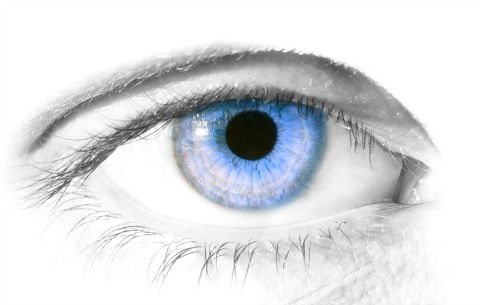 Is it only for those diagnosed with macular degeneration? The test is designed to work with those already diagnosed with maculopathy, or a disease of the macula. This includes wet macular degeneration, diabetic retinopathy, RVO (retinal vein occlusion) and several other diseases. 4. What does it mean that the app has been FDA cleared? The FDA was established in 1906 to help insure that drugs and medical devices are safe and effective. Today any medical diagnostic which addresses a specific disease condition or state must legally have FDA clearance before it can be marketed in the US. Because myVisionTrack™ is a monitor for maculopathy it did have to receive FDA clearance. The FDA rules require that the device be designed under a controlled process that from the beginning took into account the patient group who would be using it, and regularly assessed what could go wrong, and how to minimize those issues. The FDA is especially concerned about home testing where there is no test administrator and where the patient, who is known to have limited vision, is self-administering the test. To verify that this test would work effectively we ran clinical studies where actual patients tested at home for 6 months and the results were compared with lab testing to verify that patients could and would test accurately at home. We also had to have an independent laboratory verify that all the development work had been done per the requirements and the test met international standards for safety. All of these results were then submitted to the FDA for their review and final approval before we could market myVisionTrack™ and they cleared our device to go to market. Unfortunately there are many "free" vision tests available on the internet and as downloadable apps which have not gone through this rigorous development and verification process, and most will not give accurate results. Doctors will certainly not rely on these unproven tests and users should be careful about depending on these. 5. Why is myVisionTrack™ only available as a prescription? The key reason is to ensure the physician is involved. Not only does a physician have to prescribe myVisionTrack™ but we have to insure that physician gets the test results. When a significant change in vision is detected the physician's office is notified and the test results are supplied to the physician, and they determine if the patient should come in to the clinic for verification and possible treatment.